Bols Forstplanteskole will be attending the great NRGI Green Expo trade show in Horsens, which marks the town as the host of the EU. With the Fair Trees concept, the garden centre has provided a strong platform in all of Europe. Green, sustainable solutions – that is the focal point when the NRGI Green Expo trade show opens today – 18 April – in Forum Horsens. On the occasion of Horsens hosting the EU, a number of companies will, in the next few weeks, present visionary suggestions as to how to create healthy businesses with an eye to sustainability and environment. 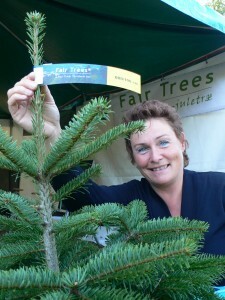 The local Bols Forstplanteskole is the sole company within the Christmas tree industry to be represented at the show. Back in 2007, the garden centre introduced the brand new concept of Fair Trees. Christmas tree seeds – forming the basis of the comprehensive production of Christmas trees in Europe – are gathered and processed, showing the greatest possible consideration for people and environment. The sustainable success has been unmistakable. Fair Trees is authorised by Fair Trade Denmark and obtained the much-coveted membership of the World Fair Trade Organisation (WFTO) in 2010. – We would like to show all of Europe that growing Christmas trees can be a healthy business in which quality is still of paramount importance; that it is in fact possible to make an effort to secure decent working and security conditions for Georgian cone pickers, who gather seeds at an altitude of up to 30 metres; seeds that later become beautiful Christmas trees in European homes, says Marianne Bols, owner of Bols Forstplanteskole. Today, Fair Trees has 25 per cent of the harvesting rights in the desirable Ambrolauri-Tlugi region in Georgia, which provides seeds to as much as 80 per cent of the total European Christmas tree production. Every single year, Fair Trees has grown bigger, which fact was most recently illustrated by the signing of a co-operation agreement expected to make a breakthrough for Fair Trees in all German-speaking countries. The wholesale company Markus Schauer GmbH in Munich has signed an important co-operation agreement with Bols Forstplanteskole and will make sure that Fair Trees expands in the German-speaking countries. There is no doubt that the green and sustainable Christmas trees will live in clover in this country. – It is a question of quite modest additional costs per tree, securing the Georgian cone pickers decent conditions. In return, the Christmas tree growers make great adjustments increasing the social and moral value. The Fair Trees tag secures the connection from the seed to the Christmas home, says Mark Schauer. To Bols Forstplanteskole, the recently signed agreement in Germany is a continuation of the fact that Fair Trees is already well-established in the United Kingdom as well as in Switzerland. More than 80 per cent of the Christmas trees sold in Europe are based on seeds of Ambrolauri-Tlugi origin in Georgia. Fair Trees has 25 per cent of the harvesting rights in Tlugi, corresponding to 16 tons of seeds. Fair Trees® is a concept developed under Fair Trade Denmark, securing a sustainable production as well as decent wages and terms of employment. Fair Trees® makes use of neutral, external auditing when working conditions, cone picking and production are to be inspected. Fair Trees® is a member of the WFTO.